Council have created a CBD Upgrade Working Group to advise Council on the implementation of the CBD Strategy. The group comprises of a number of local business owners and community representatives that have an interest in the city centre. Griffith City Council has been preparing the first stage of the Yambil Street Master Plan between Jondaryan Avenue and Kooyoo Street. As recommended in the Griffith CBD Strategy, Yambil Street will become a more inviting commercial boulevard for people. The master plan seeks to calm traffic, support pedestrians and promote a more pleasant public realm. Yambil Street will become significantly more attractive through the incorporation of street trees, new pavement and additional public seating and lighting. The street will also include the installation of a new water main, a resurfaced road and an improvement stormwater drainage system. Council is facilitating the development of a new skate park in Olympic Park. The skate park development is reflected in the Griffith CBD Strategy, recommending that Olympic Park, Olympic Street be developed into a more relevant youth precinct to support existing services and facilities in the locality. 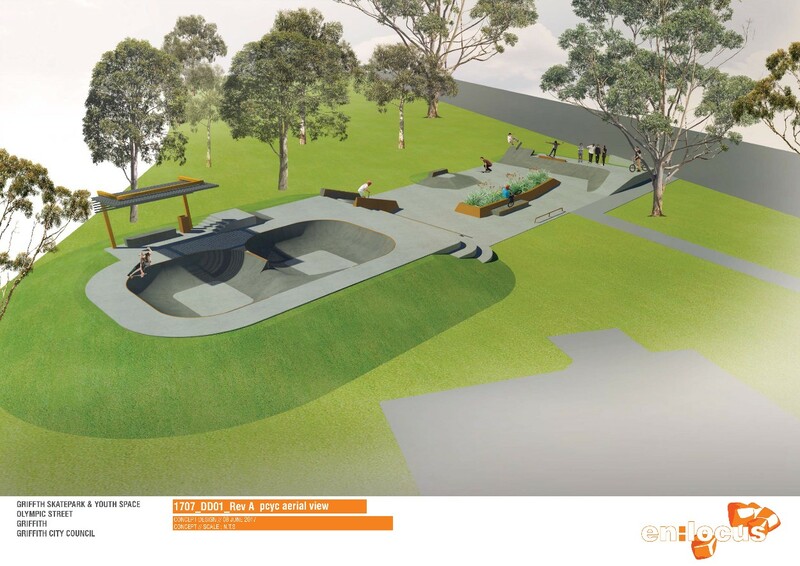 The skate park has been designed by En:Locus Pty Ltd (skate park design specialists) after extensive consultation, incorporating a skate bowl and detailed skate plaza. The design is a significant improvement from the existing skate park that is dated and deteriorating and looks to create an exciting place for young people to gather and skate. The project is a joint project between Council and NSW Department of Industry (Lands), as grant funding was awarded through the Public Reserve Management Funding Program (PRMFP) in August 2016. Council are preparing an Olympic Park Youth Precinct Master Plan across the whole site looking at a number of facilities and activities that might attract youth to the area and more activate the space.